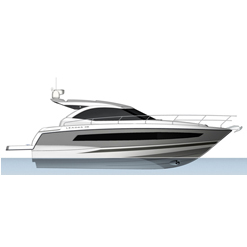 The Leader 30 is the culmination of the vast experience Jeanneau has gained in the world of cabin cruisers. Seaworthy qualities, comfort on board and innovation are the fundamental characteristics that are always present in each new Jeanneau model. The Leader 30 inaugurates a new, very dynamic style with an unprecedented combination of design characteristics: an integrated windscreen, large glass surfaces, a ventilator, and the signature of the new generation of the LEADER line – a dynamic inverted arch, distinctive silhouette of the forward cabin, a spacious hull and enlarged aft sections. 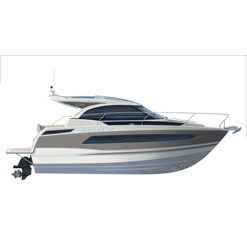 The excellent performance and handling at sea of the Leader 30 are due to the very beautiful hull design by M. PETERS and to the work of Jeanneau engineers, obtaining an excellent weight distribution in function with the multiple configurations offered. These different configurations have to do with diverse engines – diesel or gas, single or twin engine – and large equipment, such as the generator, air conditioning or heater. incomparably bright interior. This new approach will mark a new generation of Leader models. Full comfort in the cockpit, the superior double cabin and generously sized head compartment are all remarkable strengths of the Leader 30. 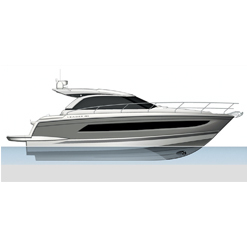 Lastly, copious storage aboard the Leader 30 benefits a cruising lifestyle.